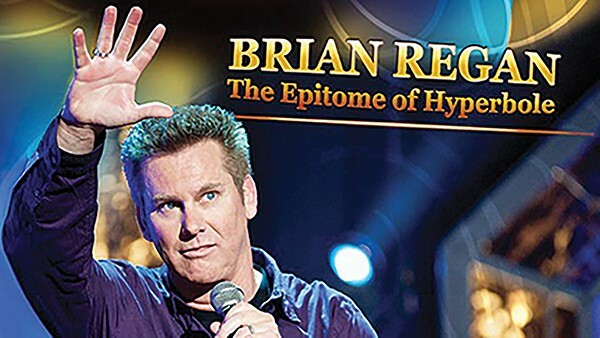 Brian Regan's an old-school observational comic and a master craftsman. Humorous anecdotes establish subtle themes, leading to satisfying gags and glorious, often unexpected callbacks. Whether or not this hard-touring veteran performer dedicated to the art of stand-up makes you grin, titter, roll your eyes, or LOL — and he can command all of the above — you've got to admire the architecture. "I guess I think about building my jokes and my overall sets like builders think about building buildings," says Regan, who's recorded specials for Comedy Central and Netflix and appeared with Jerry Seinfeld on "Comedians in Cars Getting Coffee." Comedian Brian Regan builds comedic themes. "If I had thought more about that answer, I would've thought of a way to avoid using a form of the word 'build' four times in one sentence," he adds. "I like to put several jokes together within a theme," Regan continues, addressing some of the ideas in his Netflix special Flamethrowers and Nunchucks, which touches on everyday topics like weight gain, underwear waistbands, and trips to Disneyland, but is also a lightly rendered portrait of order descending into anarchy. "A theme can last a few minutes," he says. "Usually, the individual jokes come first; then I try to organize them in a way that makes sense. Sports? Okay, let's listen to some sports jokes. Politics? Okay, let's listen to some political jokes. Buildings? Okay. ... "
Regan's bringing his act to Memphis' Orpheum Theatre Thursday, January 11th. No joke.